It seems like it’s finally time to begin setting up the growing areas. Lots of work now to make it easier to maintain through out the summer and fall and maybe into the winter if things all work out as planned. As we all should know by now, plans including mother nature can have unexpected results. For now we’ve begun building the first raised bed using the scrap lumber, tweeking the details to make more long term areas after more of the kinks are worked out. 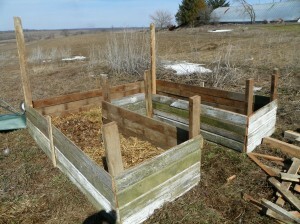 This box will be a deep raised bed good for potatoes, carrots and other deep rooted plants. Their will be fencing around the entire box to keep out the area freeloaders (deer, raccoon, etc.) and the back will be higher to grow climbers like beans, peas and cucumber. This entry was posted in general and tagged raised garden bed on April 12, 2013 by jeannethro.